This model can be loaded into OpenCell without errors but can not be integrated properly. InsP3 receptors are able to adapt to a particular InsP3 concentration, such that at a given [InsP3], all the Ca2+ stores partially empty. Because partial emptying induces faster cycling of Ca2+ across the store membrane via the SERCA pump, this theory is also known as the steady-state model. There are sets of experimental data in support of both explanations. The two theories require very different mechanisms. 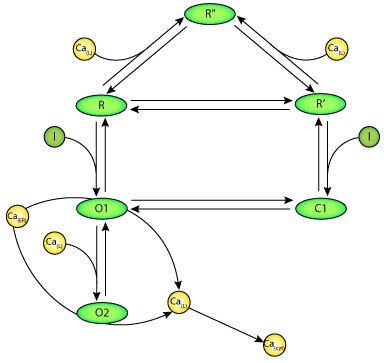 The all-or-nothing model not only requires differing sensitivities of stores to InsP3, but also a high degree of cooperativity such that a small range of InsP3 concentrations will empty a particular store whilst leaving others unaffected. Differences in sensitivity could be due to structural differences, differences in InsP3 density, intracellular cell environment, or luminal [Ca2+]. In contrast, the steady-state model seems to require complex, adaptive kinetic changes in the receptor. Mathematical steady-state models have been developed and in general they involve effects of Ca2+ binding to sites within the channel or to sites in the channel mouth, although there is also evidence that the InsP3 receptor can show adaptive behaviour. Models of adaptive behaviour at the single channel level have been developed for the structurally homologous ryanodine receptor. It has been suggested that similar mechanisms account for the behaviour of the InsP3 receptor. Using the Sachs et al. ryanodine receptor model as a foundation, Dawson et al. develop such a model. They begin with a relatively simple situation with no Ca2+ fluxes (see ), to more complex situations which account for the positive and negative feedback from Ca(cyt), and the inactivation of the receptor in the presence of Ca2+ (see and ). This final model is an adaptive model of the InsP3 receptor that can show either all-or-nothing or steady-state behaviour, depending on the experimental conditions. The model suggests that the receptor has two interconvertible conformational states: one that rapidly binds InsP3 but has a low affinity for the ligand, while the other state binds slowly but with a high affinity. The models have been described here in CellML (the raw CellML description of the Dawson et al. 2003 models can be downloaded in various formats as described in ). 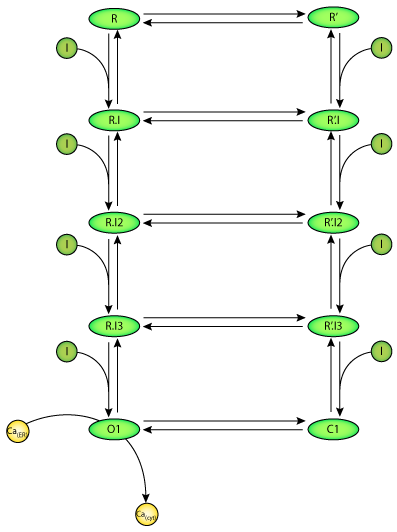 Scheme 1: An adapting model of the InsP3 receptor. Scheme 2: An adapting model of the InsP3 receptor which includes feedback effects of Ca2+ near the channel mouth. 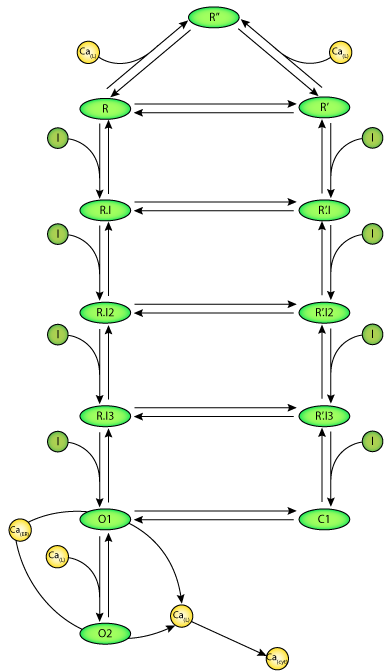 Scheme 3: Adaptive channel model based on the occupation of one InsP3 binding site being required to open the channel. Derived from workspace Dawson, Lea, Irvine, 2003 at changeset b690a07a26b8.